Our apple trees are finally starting to bloom. Our peaches, plums, apricots, and hybrids have already finished blooming. Our Anna apple is in full bloom and really has a lot of blooms in comparison to years past and given that it is only three years old. Our Granny Smith is also starting to bloom, but it does not have anywhere near the number of blooms as the Anna. Our Newtown Pippin similarly starting to bloom, but I will not allow these blooms to fruit given that the tree is only one year old. I want the Newtown Pippin to direct its energy to building its root system and branch structure - not fruit. The remainder of our apple trees have not yet started blooming. The photograph below is the Anna. I had a hard time exposing this photograph so you could clearly see the blooms. Given the background in this photograph, they are difficult to see. If you are interest in growing apples in Texas, an important consideration is always the type of rootstock that your tree will have. Some rootstocks are hardier than others. Some do better in our clay soils. 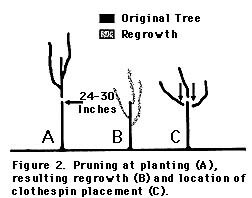 Rootstock also dictates how large your tree will eventually become. 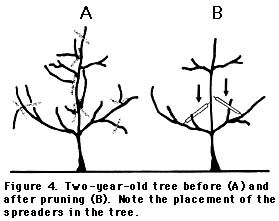 Read the following posting by Kuffel Creek about rootstocks - Rootstock Article. He posits that rootstocks will underperform in size in a hot climate like California -- or by extension, Texas. Consequently, he contends that an M111 that should grow to 12 feet, will only grow to 8 to 10 feet in a hot climate. That is a good size for a suburban yard. These uncommon heirloom apple varieties are rich with flavors that intrigue and delight. A few years ago, I saw an ad that showed a grid of apples. Their varied shapes and colors made them intriguing but, according to the ad, problematic. One was too square, another too lumpy, a third too long, and a fourth too dull looking. The way to solve all these "problems" was to turn them into juice, the product being advertised. That way, one would completely bypass their quirky personalities. The goal was to eradicate difference in favor of sameness. But it's the differences among apples that we should value, especially the old, late-season varieties for which high praise is due. There have been passionate fans and growers of apples for generations. For example, The Apples of New York, published in 1905, lists hundreds of varieties, with full descriptions and illustrations of the fruit documented. One looks at all these age-old heirloom varieties with their wildly differing shapes and colors, stripes and spots and unfamiliar names, and wonders, where did they go? Mostly, they died out, the victims of changes of taste and mass marketing. But some fine apples remain, which is why we must support antique-apple orchardists, who continue to grow and propagate the heirloom apples varieties, and who might even ship them to us to taste or to grow in our own gardens. 'Cortland', 'Empire', and 'Macoun'. Later, other varieties arrived from apple farms around the United States, treasures that included 'Esopus Spitzenburg', 'Ashmead's Kernel', 'Calville Blanc d'Hiver', 'Maiden Blush', 'Cox's Orange Pippin', 'Grimes Golden', and the very small 'Pitmaston Pineapple'. They were too special to enjoy alone, so I hosted a small apple tasting. We sliced the apples into wedges, thoughtfully nibbled, and then gave our impressions. Later, we enjoyed the remains with cheeses and roasted nuts. You might organize a similar gathering with friends and family, or for your local community garden. Go here to read the remainder of the article. Here's a fun article on growing apples in Virginia for making cider from the Charlottesville c-ville. It is tempting to imagine that the resurgence of Virginia hard cider had its genesis in a single moment: Monticello’s Director of Gardens and Grounds Peter Hatch and Virginia gentleman Tom Burford kneeling together with their grafting knives to re-propagate the Virginia Hewe’s Crab apple tree in Thomas Jefferson’s north orchard. While the image isn’t quite true to life, it represents the way Burford has used the return of Thomas Jefferson’s fruit trees to Monticello to spread his own message: People should be making cider out of obscure apple varieties, because a long time ago they were worth their weight in gold. Newtown Pippin, Harrison, Hewe’s Crab, Roxbury Russett, Ashmead’s Kernel, Esopus Spitzenburg, Red Limbertwig. The names evoke a world of abundance, specificity, and sophistication that characterized the apple trade when cider was king. Today, there are only three commercial cider producers in Virginia. A modern day Johnny Appleseed, part philosopher and part planter, Burford wants to put hard cider back on the dinner table, and he thinks teaching people to grow the right kind of apples is the way to do it. “The barriers are access to cider making varieties. Demand is greater than supply. And here is another pitfall. If we begin to use less than appropriate varieties we are going to produce inferior ciders,” Burford said. To read the rest of the article, go here . . .
As with my cherries, my pear trees and asian pear trees did not produce very many blossoms this spring. Rather, they primarily went straight into leafing out with only a few blossoms. I do not think this was the result of overpruning, but I will do some research and speculating, and then I'll report back why I think this happened. Nevertheless, my Magness pear has produced beautiful blooms. Similarly, the few blooms on my asian pears, Hosui and Shinko, are also lovely. Some of my apple trees started to bloom this past week. Particularly, my Anna, Granny Smith, and Fuji have started to bloom. The photograph below is from the Anna. My other apple varieties have not started to flower yet, including the: Gala, Braeburn, William's Pride, Wynooche Early, Spigold, Cox Orange Pippen, and Goldrush. I do not expect the six new apple trees that I planted this winter to flower: Mutsu/Crispin, Esopus Spitzenberg, Newtown Pippin, Calville Blanc d'Hiver, Rubinette, and Ashmead's Kernel. If you are interested in growing apple trees in the South, Kuffel Creek Orchard has an interesting website identifying some of the apple varieties that have done well in Southern California's warm climate in their own testing - Kuffel Creek. Here is a list of approximate bloom times for apple trees. This listing should help you in deciding on your apple trees to make sure that you have two trees which will pollinate each other. You want at least two trees pollinating around the same period of time. If you have the space, you really want to have two cultivars for early, mid, and late season. That way, you will extend your season of ripening fruit.